Reviewed by Chris Arnsby. Mike Read: "Hello gang. Welcome to Top of the Pops. Terrific show lined up for you tonight, lots and lots of fab artists starting off with Dexy's Midnight Runners and Come On Eileen." Dexy's Midnight Runners: Come On Eileen. Where's Mike Read been? He last presented Top of the Pops in February. Why is Kevin Rowland the only person allowed to wear a shirt under his denim dungarees? How repulsed are the audience that Dexy's Midnight Runners are performing with no shoes and the raised stage places their stinking feet at face level? So many questions with no answer. Yazoo: Don't Go. 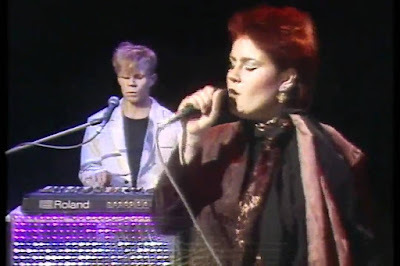 An endearingly bonkers video in which Vince Clarke (and his stupid hair) makes a Frankenstein, and then dresses up as Dracula to menace Alison Moyet. The relevance of all this to song is tenuous but it looks like everyone is having a great time raiding the dressing-up box. When is a Toblerone not a Toblerone? That is the question currently being asked as the makers of the world’s most impractical but apparently "legendary" chocolate bar launch court action against budget store Poundland’s proposed if rather inaccurately named Twin Peaks (I counted twenty peaks on it). Will David Lynch also sue them for using the name of his soporific tv series? Reviewed by Chris Arnsby. Simon Bates: "Hello and welcome to the party. It's studio eight at Television Centre with a live Top of the Pops. A great 35 minutes. And to kick us off, The Belle Stars and the Clapping Song." The Belle Stars: The Clapping Song. Simon Bates? Presenting a live Top of the Pops? I might doubt his ability but BBC Genome proves me wrong. It turns out he's quietly become Top of the Pops' backup live TV guy. The first eighties edition broadcast live (or at least the first one flagged in the Radio Times) was the 900th edition of Top of the Pops shown on 09/07/1981. Peter Powell had a go next in September, before David "Kid" Jensen arrived back from CNN and handled the Christmas Eve edition and the first of the next cycle of live editions on 04/03/1982. Simon Bates follows with one on 11/03/1982. The pair then alternate as presenters and live shows settle into a pattern of one each month. Away from the dizzy whirl of Top of the Pops Simon Bates also shares presenting duties with Gloria Hunniford on a late night BBC1 show called Saturday Live (that's original) which ran for six weeks across the summer of 1982. Thanks for that BBC Genome. That's really helpful. I only have one last question; why did you also flag episode one of Fanny By Gaslight (24/09/1981 Fanny fans) in my list of Simon Bates search results? Meanwhile, on stage The Belle Stars do a really good job of getting this edition of Top of the Pops started. BBC dressing rooms were not large. 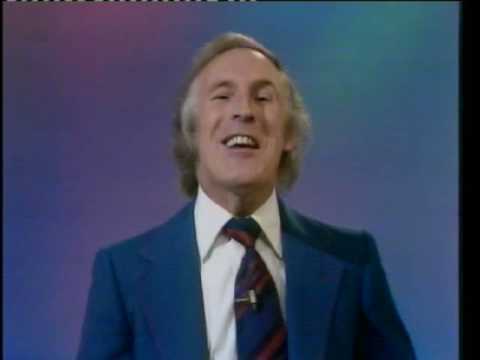 I never laughed at television as a kid as much as I did when Bruce Forsyth was doing The Generation Game, at least that’s what my mum tells me. She could hear me and my brother laughing away each Saturday evening and I remember that programme too. A basically silly idea of getting adults to do awkward though not impossible tasks would have been amusing enough on its own but with Brucie hosting it was brilliant. What you can see now as an adult is his ability to communicate with members of the public, a rarer gift than you might think- how many politicians would love to have that at their command? Brucie did it by never mocking or belittling contestants, rather he laughed with them, commented on what they were doing and pulled an expression that made you smile. What I never knew then was the extraordinary career he’d already had before the show, a career that lasted for seven decades. Its funny how things come round. Back in the Seventies of course Mum looked after us. Now in the past five years I’ve been increasingly looking after her and Brucie was back in our lives again on Saturday nights. 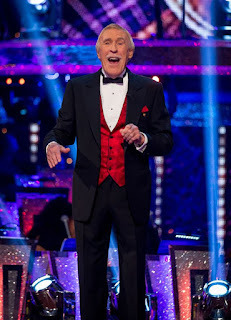 Now I don’t know much about ballroom dancing but do you know what, Brucie made Strictly Come Dancing a great show, still in command, still showing his skills. Sometimes he’d even tap dance, in his mid 80s. He seems to have been with many generations, going right back to his early successes in the Fifties and then post Generation Game, those shows like Play Your Cards Right which I’ve never seen but know the catchphrases for anyway. Brucie was always a bonus whatever show he was on, the last of the great all rounders. Nice to see him? It was brilliant to see him! 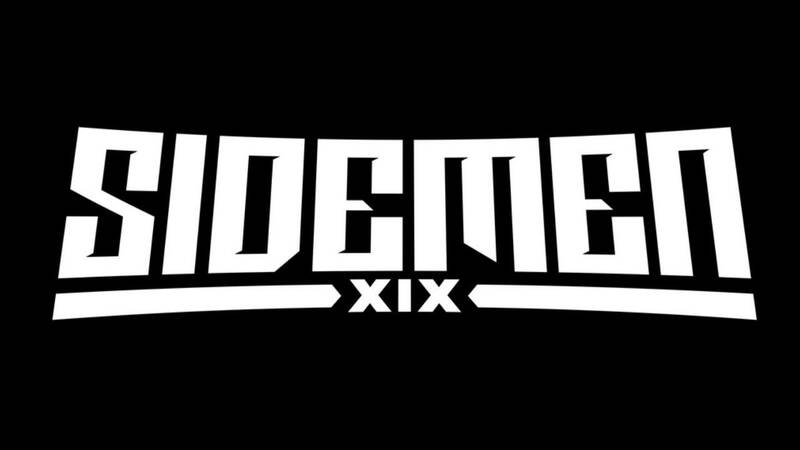 The Sidemen versus KSI- real or fake? It’s all been kicking off on YouTube since KSI left The Sidemen. Or is it really? 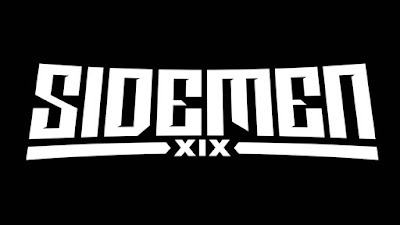 OK some of you will be wondering what I’m talking about so here’s a short 101 on The Sidemen. They are football and gaming vloggers with a following of some 35 million subscribers. Though each have their own individual channels they also combine their efforts like the Power Rangers (but without powers) as The Sidemen. Since forming in 2013 they have become a global brand with a range of clothing, a best -selling book and enough popularity to fill a football stadium as they did for a charity match back in May. However where there were seven of them there are now six. KSI, the most popular and controversial of the group quit earlier this month after distancing himself from the others for some time. Since then- and it’s only a couple of weeks- so called diss track videos have been flying back and forth with the ferocity of a Game of Thrones battle sequence. I’d love to include one of these in this post but frankly they are just too near the knuckle (blogging is still a safer environment than vlogging). Whether or not you care about the falling out of people you’ve never heard of, what this is really about is the difference between what is real and what isn’t and whether the obvious fun both sides are having with this `split` is sending the wrong messages to their followers. 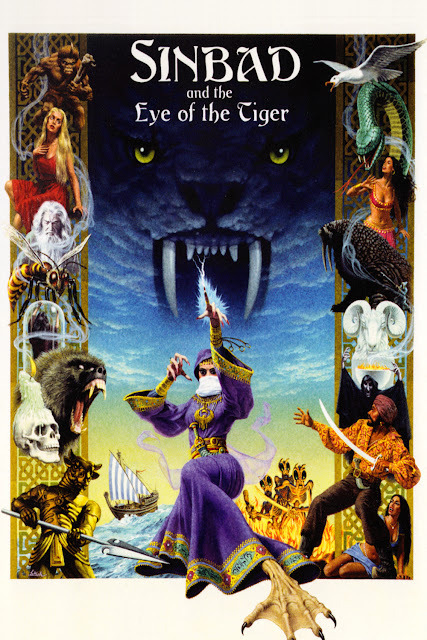 How you respond to a film like Sinbad and the Eye of the Tiger depends on how you approach it. If you’re looking for flaws and things that just don’t match the sleek effects of today you’ll find plenty. If you’re willing to indulge the entertainment of another age then you may find yourself enjoying the ride. Forty years old this year, the movie comes alongside the other two big screen Sinbad outings (reviewed last month) in a well presented box set including both DVD and Blu-ray versions. Reviewed by Chris Arnsby. Peter Powell: " Hi! Welcome to the party! Another edition of Top of the Pops! On the show tonight we've got David Essex, Cliff Richard, we've got Visage, Japan, Dexy's and many others but for starters Hot Chocolate with ..! Hot Chocolate: It Started With A Kiss. A slightly slower tempo song than is normally used for the first performance, but it's great so who cares. Paul McCartney: Take It Away. Ooh look Ringo's in this slightly self-aggrandising Paul McCartney video. And John Hurt. On this occasion an alien doesn't burst out of John Hurt's chest. Cliff Richard: The Only Way Out. Ugh, it's Cliff and he's wearing nasty leather trousers. Apparently this song is about God, which explains why Cliff Richard keeps pointing up on the line "and it's yooooo." 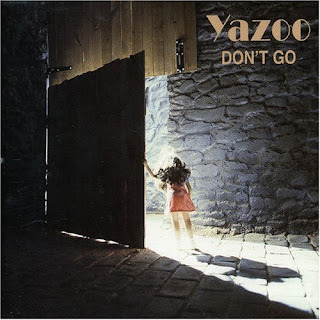 Yazoo: Don't Go. I am turning into my nan. I find myself annoyed by Vince Clarke's fringe. Could the real reason why he left Depeche Mode be because Dave Gahan wouldn't let him grow stupid, floppy hair at the front of his head? For a film whose theme is about being yourself and not hiding things, the title is somewhat misleading but this is a subtle coming of age drama that travels familiar roads but has a refreshing tendency to veer off when you least expect it to. What you think is going to happen doesn’t and by the end you may well find yourself getting excited over the result of a rugby match and, you know, that’s not something that normally happens. 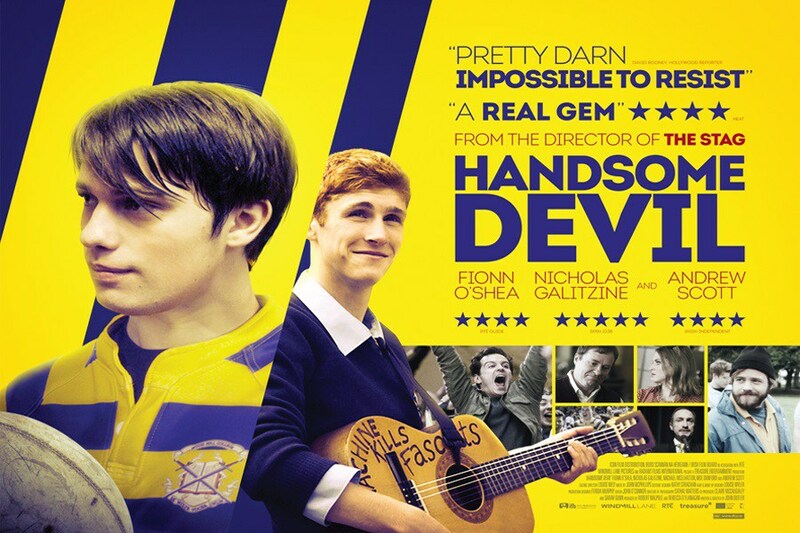 Writer / director John Butler gleefully plays with tropes that anyone whose watched any American high school film will recognise but imbues each with something more. 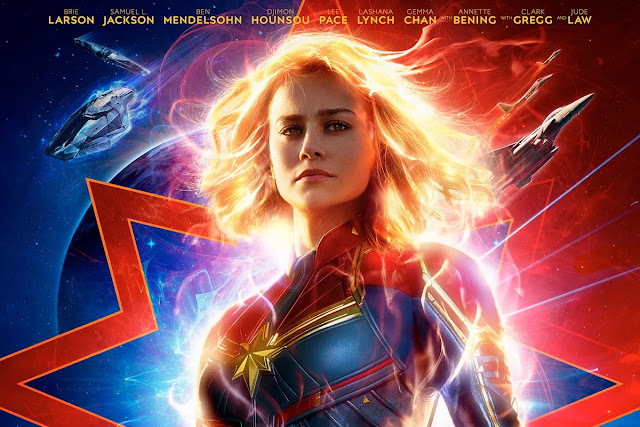 It has been reported this week that more than half of those who watch ongoing series catch multiple episodes in what is being called `bingewatching` or `box set Britain`. Many even miss out on sleep in order to just watch one more episode before bedtime. This isn’t a new thing as such- ever since videos people have been able to watch episodes of series whenever they liked but it seems to have grown now the likes of Netflix and Amazon have started dropping whole seasons at a time. Whereas with videos, dvds and blu rays you’d probably already watched weekly episodes first, now you don’t have to. You can watch all the episodes in one day if you want but if you do are you missing out on an important aspect of episodic drama?